Erosion not only gave us the Grand Canyon but also the distinctive red rocks seen throughout the Southwest especially, on the Colorado Plateau. Exposure of sedimentary rock laid down at the bottom of an ocean hundreds of millions of years ago has caused the iron in the deposits to be exposed to the air and oxidized into many colors of yellow, orange and red. A distinctive, non-geological feature of the Colorado Plateau is the Four Corners where Utah, Colorado, Arizona and New Mexico come together at a point. It is often referred to as Red Rock Country. Four Corners Monument is in the Navajo Nation, as are many of the regional parks including Monument Valley. Fremont Ellis (1897-1985) was essentially self-taught and supported himself in Santa Fe as a photographer and a sign painter. Yet, in 1921, he founded one of the town's earliest art group, Los Cinco Pintores. In her book on Ellis, Barbara Spencer Foster wrote about the artist's admiration for Payne and anything he wrote. She notes that in one of Payne's books, Ellis underlined the passage: “Individuality in thought, respect for nature and established truths and principles combine to make the road that can lead to true original artistic expression. There may be other means, but they have not been found, and it is doubtful if they ever will." 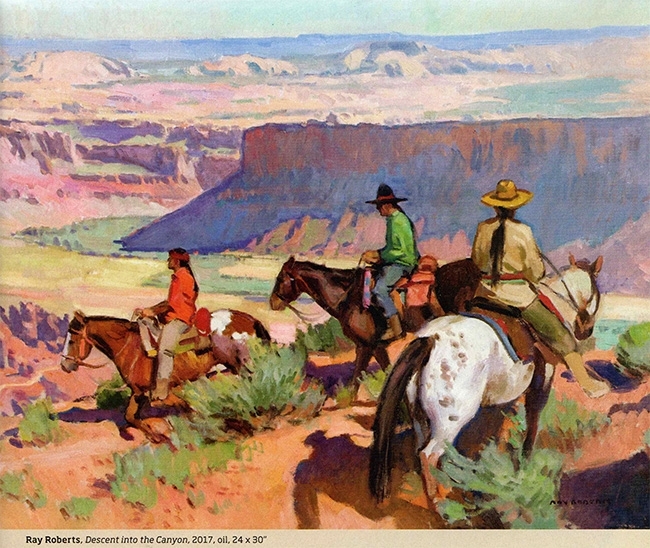 In 1917 the Atchison, Topeka and Santa Fe Railway commissioned Payne to paint the Southwest in a bid to attract tourists to the region. He spent four months in the Canyon de Chelly area and became intimately associate with it. 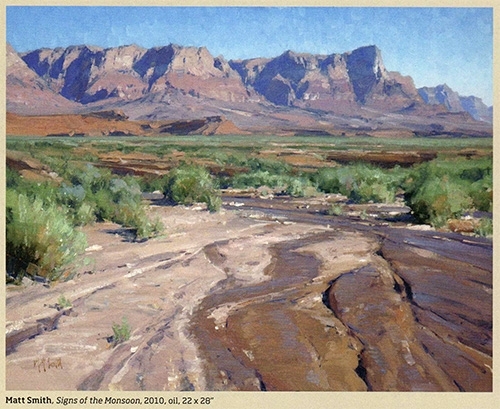 Study of Navajo Country is one of his freely painted plein air works of the region. 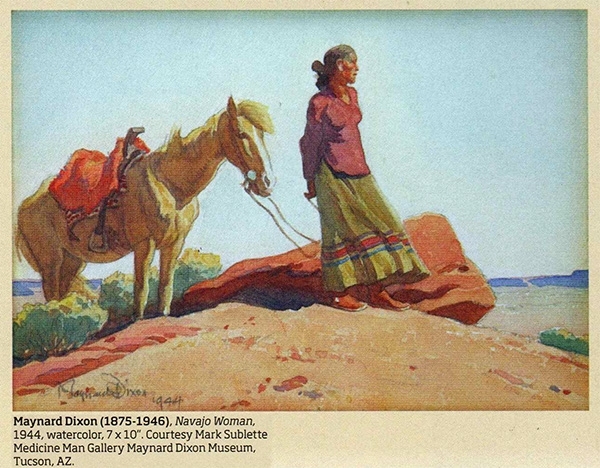 Maynard Dixon's watercolor Navajo Woman, 1944, is one of his many drawings and paintings of the people of the southwest. 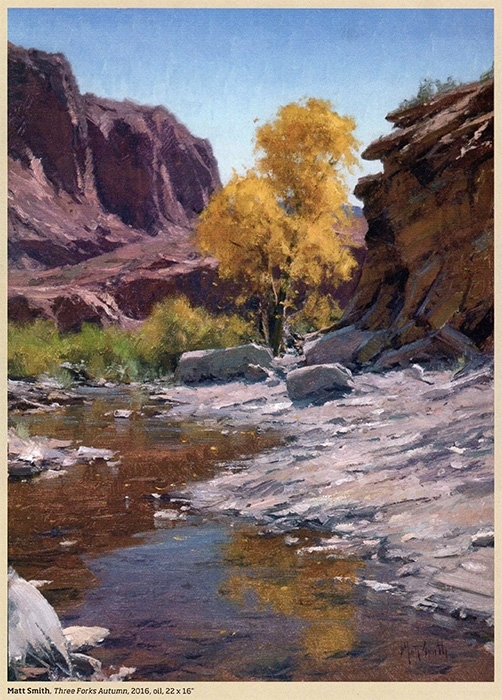 Dixon was most inspired, by the landscape. He said, “I love the grim gaunt edges of the rocks, the great bare backbone of the Earth, rough brows and heaved up shoulders, round ribs and knees of the world's skeleton protruded in lonely places.” He developed a style that stripped the landscape to its essential forms in strong, light-filled, geometric compositions. Among today's interpreters of the red rocks is Denise LaRue Mahlke who works with soft pastels. Her medium is almost the dust of the desert itself. She works outdoors and completes larger works in her studio. She says, “My desire is to express through my paintings and drawings, something of what I felt in my experience of being in nature, in that place, rejoicing in the moment." Ray Roberts first experienced the red rocks on a field trip from his boarding school in Northern Arizona. He continues to travel to the area to feed his "artistic soul. 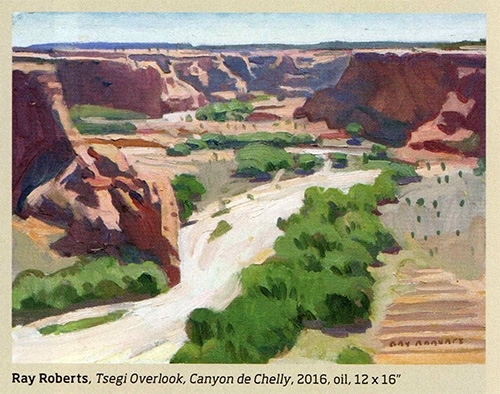 There, the geology, geometry, color and clarity is where I find my artistic purpose.” Even in a 12-by-16-inch plein air painting such as Tsegi Overlook, Canyon de Chelly, 2016, Roberts captures the nuances of color and light as well as that “something that speaks to me emotionally” that gives his art immediacy and life. Matt Smith says, “I enjoy working in areas where one can travel for miles without seeing the influence of man. When I paint, l feel I’ve hit the mark when I've captured a balance between mood, look and feel.” in Signs of the Monsoon, 2010, he paints the constant creation of the desert landscape. The mountains that were ocean sediment continue to erode from wind and rain. Signs of the monsoon remain in the still wet riverbed. It will turn dry until the next torrential flood. Water running through Red Rocks Country brings life as well as destruction. The Navajo have farmed and raised sheep in the region of Canyon de Chelly for generations. Russell Case emulates Dixon’s sense of scale in Sheep Keepers, 2017, the figures dwarfed by the towering cliffs. Red Rocks Country continues to evolve and continues to inspire artists whose responses are as infinite as its vistas.